Classic-Castle.com • View topic - The siege of Campelia Castle. A BC entry. The siege of Campelia Castle. A BC entry. 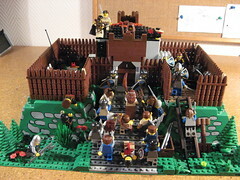 After many years of hunger and need the peasants got tired of it and revolted it begun with the destruction of Wylsemyr castle and will end when they crush Campelia Castle. Link to Flickr set: Linky. This is my second entry into the BC so please do enjoy. Re: The siege of Campelia Castle. A BC entry. Interesting use of the raised baseplate- you've incorporated it pretty well I think. Hehe good job man, you've really caught that wooden palisade look with those walls. I too like the palisade walls. It's funny that the peasant charge is being led by a lady with a broom. CastleLord wrote: This is my second entry into the BC so please do enjoy. I do. Very much so. I'm a big fan of wooden castles and this one is very good. I like the wooden walls as well. Reminds me a little bit of the peasants revolting and attacking the outpost in the beginning of Braveheart. Once again thanks for the nice replies! Nicely done. It seems very neat and woody. Like everyone else has said, the walls are well done. Good luck in the contest!